We don our smiley t‑shirts and our baggiest trousers and put Acidlab's 303 clone to the test. With the cost of entry-level digital mixers having dropped sharply over the last few years, there's never been a better time to invest in a digital mixing console. Can you really enjoy super-wide stereo sound from such a tiny amp? What secrets have Elysia hidden inside this modest‑looking rackmount case? FMR have improved on their classic designs as they turned them into 500-series bargains! M-Audio's latest budget monitors punch way above their weight. By designing a signal processing environment that offers endless modulation and routing options, Native Instruments hope to reinvent the way we use effects. 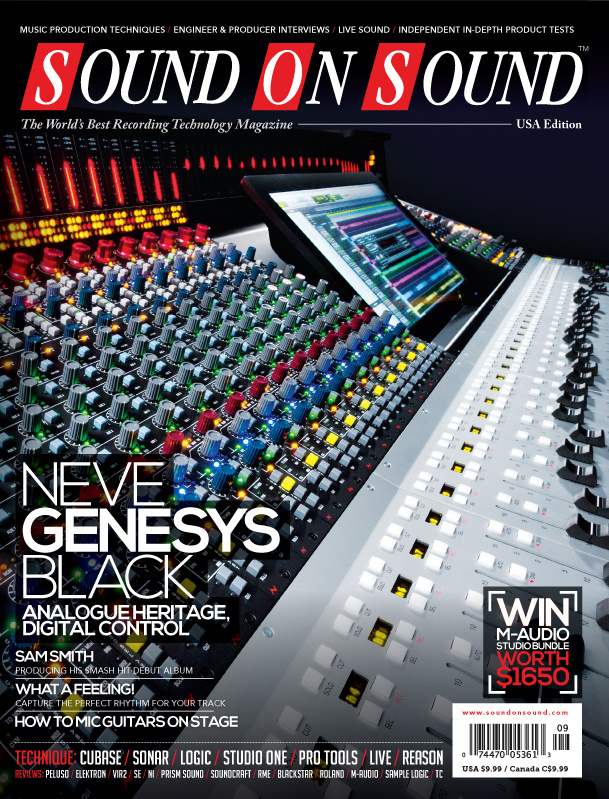 Classic, yet unashamedly modern, Neve's latest analogue console promises seamless integration with the software studio. In their ongoing quest for authentic vintage tones, US mic makers Peluso tackle the classic Neumann M49. Roland bring their HandSonic percussion range bang up to date with the HPD20. Arpology combines Sample Logic's wealth of sampled sounds with a sophisticated arpeggiator to create a unique virtual instrument. How have sE improved on their innovative Reflexion Filter? SE give their popular X1 a valve boost, while keeping the price within reach of the masses. With the new Si Performer range, for the first time ever you can control lighting and sound from the same desk. But what's it like to use in practice? Have Tree Audio gone out on a limb with their vintage-voiced valve channel strip? Waves' clever enhancement plug‑in offers several ways of making your music bigger! Perhaps the most versatile track type in Pro Tools is one that you can't even record to! Learn how to extract the rhythmic elements from your favourite tracks and apply them to your own sounds and compositions. Automatic double-tracking is a doddle in Reason. Read more about Get Pitch Quick! Electric guitars are one of the cornerstones of modern music, but miking them up can prove tricky. We round up some top tips from professional engineers. The ability to sync delay times and other Studio One parameters to tempo is a fertile source of inspiration. Ajimal: Guy Massey shares tips and tricks as he records the winners of Focusrite's Dream Recording competition at AIR Studio. Hear the final track and watch the video about the session. Save time and effort with these power-user techniques for Sonar. Need to give your productions a shot in the arm? Here are 10 ways to make a beat in Logic Pro X. From humble beginnings, Joey Sturgis has become a leading producer in the highly technical metalcore scene. This month we review albums from Stark, Smoking Grace and The Goddamn Wallbangers. All work and no pay: is working for free always wrong? We might be used to rapid technological change – but is our audience? First mastering went online, now it's becoming automated. Should we be afraid? Media content for the September 2014 issue.